I have a desktop that has long been having issues renewing it's IP address. This wasn't a major problem because I was on a wired network, and it would stay connected as long as I needed it to. The only way I am able to get re-connected to a network is to restart my computer, I have seen other people with similar issues in these forums, however I could not find a good answer, or a post with a lot of detail. I assumed my troubles were because of an old on-board LAN adapter and I was too lazy to get a new one and find out. 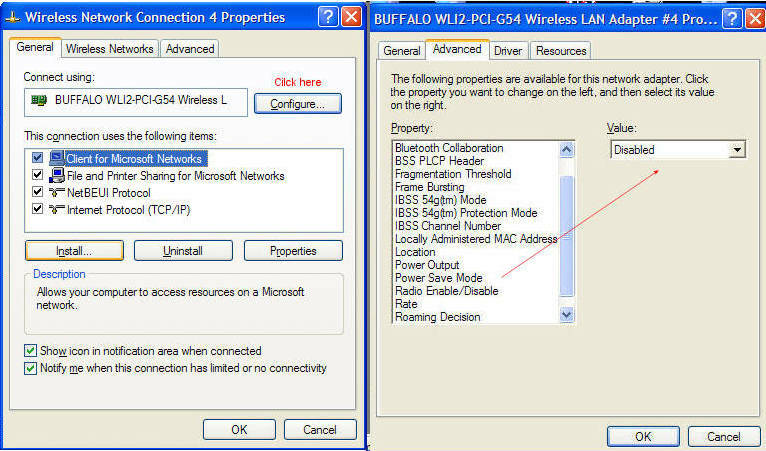 I am now using a PCI wireless network card and I am having the same issue, any time I try to reconnect to the network, whether I am currently connected or have been dropped, it IS able to talk to the router, but it cannot obtain an IP address and I get "Limited or No Connectivity"(WinXP SP2 by the way). I get the error whether I am trying to reconnect using Windows Wireless Network Connection, or Ipconfig at the command prompt. I am almost certain all of my DHCP settings are correct. Another thing that may be helpful is when I leave my computer on for several hours without activity, the network will not respond and I have to restart because I cannot release/renew. The symptoms are exactly the same with Wired and Wireless, so it seems like a Windows issue. I appreciate the time anyone took to read this long post, and please let me know if you have any idea. Hopefully that will resolve your problem. Sorry, that didn't help. I have full network connectivity while the network is active, so the White Paper does not help me determine why my computer will not renew it's IP. I have also had the same issue with different routers and DHCP servers that function normally with other computers. Look at the power saving of the network cards and make sure that it is disabled. Those decimal numbers are MEANINGLESS. 192.168.foo.blahblah... they are confusing because the computer has helpfully turned binary into decimal numbers. Forget about them for now. Just think, "the computer doesn't know what 192 is... shouldn't I know how the computer thinks?" Yes. Yes you should. And it's not hard. Binary is easy; there's only 2 numbers to remember: 1 and 0, on and off. Like a light switch. In fact, that's how computers think: millions of on and off switches. Marvel in that thought. I'll wait. I will swear in this document. Take THAT! The network mask is simply how the computer knows which part of the IP is the network bits versus the hosts bits. Like separating jellybeans with a friend: "Here, Mr. Network, these jellybeans on the left are for you, and I keep the ones on the right for me, Mr. Hosts." The broadcast address is reserved for multicasting, basically the last useable address in a block, which is used for broadcasts on the network that don't want to hear back from anyone, or maybe only a few hosts. Like shouting into a megaphone in a crowd, "Okay, who here has not gotten a raffle ticket? Last call..." You only want to hear from the people that don't have one, not "I have one" from everyone else. You don't really need one to get an IP, but I hear people ask this a lot. A default gateway is where the network sends packets that it doesn't know what to do with. This is your network saying, "This isn't mine, here, you take it." If the gateway doesn't know where it goes, it passes it to ITS default gateway, "this isn't mine, here, you take it," and so on up the chain until someone takes it, or it comes back, "Bzzzt... can't find address. Thank you for playing." A default gateway is only needed if you have to send traffic outside your network, for like, you know, Internet browsing and such. But if you have 10 computers in a LAN party, and don't want outside access, you don't really need one. DHCP means a DHCP server on a machine gives you an address, netmask, broadcast, and default gateway. Your machine boots up, sends out a multicast "Hey! Yo! Over here! I need IP, dog!" and the DHCP goes, "I got your IP right here, G!" Then the machine sets itself. This IP is taken from a "pool" of free IP addresses, and each time the machine makes another request for an IP, it may end up with a different one. DHCP is best for laptops or workstations where the IP address doesn't really matter just as long as you have one. It also is great for managing networks. Static IP means the machine always has the same IP, which is most useful for servers. Usually, though, you have to set everything yourself. This is taken from the first octet in the IP address. If n = 4 then it would have been 16, less than 25. Note: At this point, you should account for expandability, if you are going to need more than 30 (25-2 )sub-networks in the future, you should go one greater, like 62 (26-2). Remember, the more networks you have, the less collision domains you have. But you will need routers to get them to speak to each other. So 5 bits stolen is really 128 + 64 + 32 + 16 + 8 = 248 (in decimal). If you think this is fun, wait until I write about Binary to Hexadecimal! But now we are getting off topic. 26 - 2 = 62, which is > 50. So we need to steal 6 bits from the host portion. 28 - 2 = 254, which is > 192. So we need to steal 8 bits from the host portion. 26 - 2 = 62, which is > 44. So we need to steal 6 bits from the host portion.